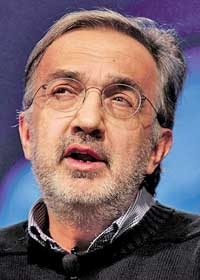 The VEBA, "is not a natural shareholder" and will want to sell its stake, Marchionne told reporters. "I'm happy to help them with that." BELVIDERE, Ill. (Reuters) -- There is a "better than 50 percent chance" that Fiat S.p.A. will increase its stake in Chrysler Group in July, CEO Sergio Marchionne said today. Fiat has an option to buy a 3.3 percent stake in Chrysler from the retiree healthcare trust affiliated with the UAW beginning in July. The trust, known as the VEBA, "is not a natural shareholder" and will want to sell its stake, Marchionne told reporters here. "I'm happy to help them with that." Fiat took management control and a 20 percent stake in Chrysler three years ago when the automaker emerged from a government-funded bankruptcy. Since then, Fiat has raised its stake in Chrysler to 58.5 percent. Starting in July, Fiat has the option to buy 40 percent of the VEBA's stake in Chrysler in small increments. Fiat can buy a maximum of 3.3 percent of Chrysler every six months. This option expires in 2016. Marchionne did not say how much he was willing to pay for the stake. On another topic, Marchionne said Fiat is open to expanding its newly announced partnership with Mazda Motor Corp. and building the Japanese automaker's vehicles at Fiat and Chrysler factories worldwide. Marchionne said he was open to additional partnerships to help lower the automaker's costs and expand its global reach. "We will continue to look at other bilateral arrangements," Marchionne said. "We're totally open." Fiat has already built the small Fiat 500 in a joint venture with Ford Motor Co.'s Ka; the Fiat Punto with General Motors Co.'s Opel Corsa; and the Fiat Seidici with a Suzuki Motor Corp. mini-SUV, sharing the investment costs of around 1 billion euros ($1.26 billion) needed to develop each new car. "The economics make it very difficult" for most automakers to continue to produce all their own platforms and powertrains, Marchionne told reporters. "We're willing to engage in discussions with anyone else."